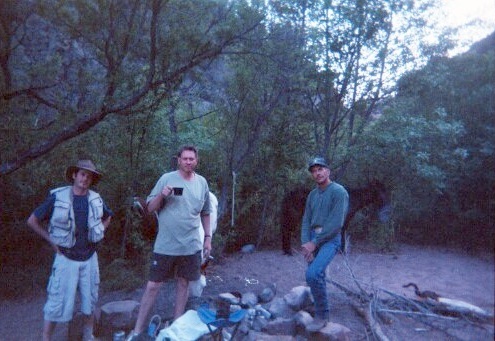 I've finally gotten around to writing my report on the Hellsgate trip, a one-nighter I did in May, 2002. I trekked out alone with pack, camera and tape recorder. The latter was in lieu of a notepad and pencil by which to document the various happenings on my journey. I left Fountain Hills on Saturday morning around 7:30 am. 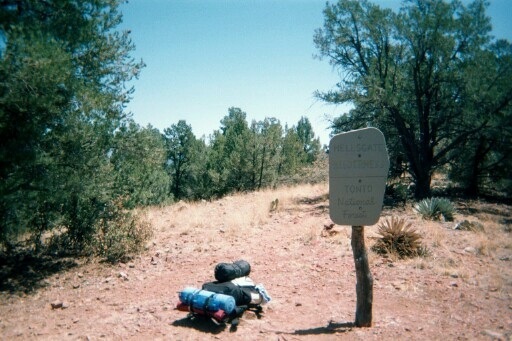 and arrived at the trailhead 11.6 miles East of the McDonalds in Payson on route 260. The turnoff FR 405A is a paved road that becomes a dirt road within 50 yards. After you turn off of 260 onto FR 405A, you just go straight onto the dirt road. Follow it for 0.4 miles to the trailhead where you see a large clearing area to the right. You can make this in a sedan if you need to with no problem. 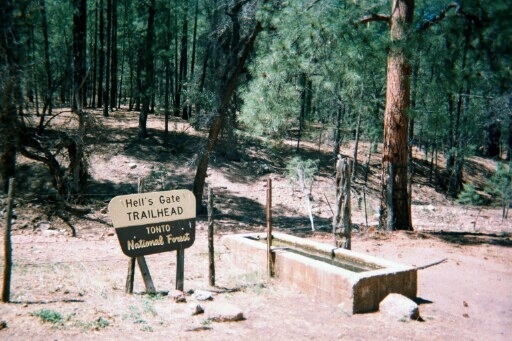 The trail is marked Hellsgate. I began my hike at about 10:30 am. by going uphill to the South. The main point to remember about this 7.1-mile trail into Hell's canyon is that, for the first four miles, it is either a narrow trail or an old dirt road. 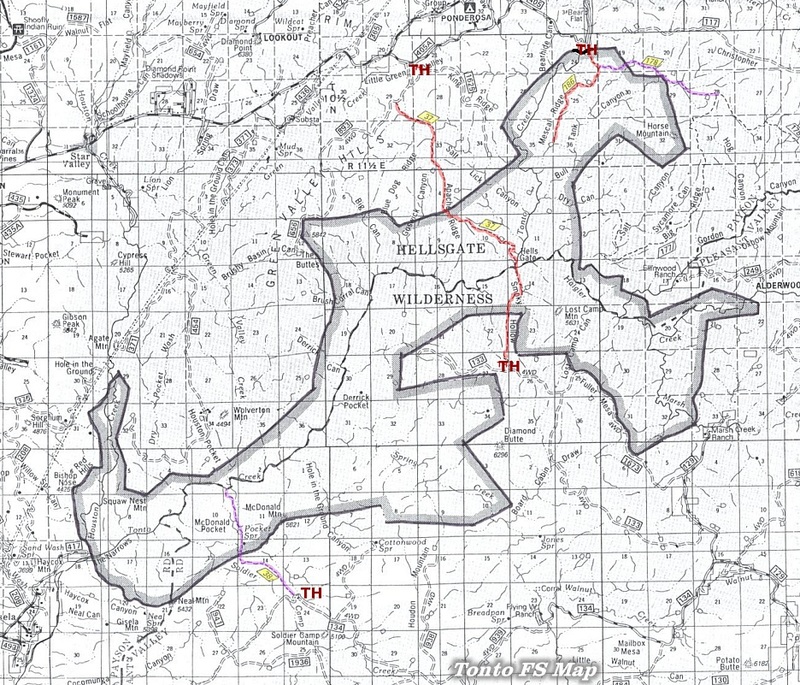 It can be confusing because the two crisscross along the way, at the same time crossing over an old creek bed (dry at this time) several times. The point to remember is that it really doesn't matter whether you take the narrow walking trail or the old dirt road - both will get you to the edge of the wilderness area, which, by the way, is marked by a sign 4.4 miles into the hike. 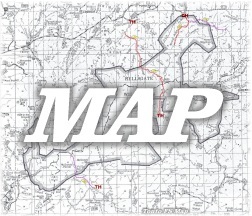 From the very beginning of the hike, you will have the option to take the trail or the old dirt road, so just remember it doesn't matter which route you take (narrow trail or wider old dirt road). The narrow trail is pretty well marked with cairns along the way. Overall, the hike is pretty strenuous (up and down), although there are some fairly long sections of relatively flat land. After you reach the 4.4 mile mark, the trail generally descends from there into the canyon. The last 0.5 mile is really quite steep and strenuous. I caught up to and passed three guys just before this steep descent, two on horse, one on mule, another mule for carrying supplies and two dogs. It is not recommended to take horses down the last 0.5 mile, but they did, and boy was that impressive! I made it down into the canyon by 2:30 pm., about a four-hour ordeal altogether. The fellas arrived shortly after I did & Joe, Paul and Dana, who were friendly enough to invite me over to their campsite for company if I so desired. Of course, at that point they had not yet set up camp, but they seemed to know where they were going. I found a nice spot on sandy ground about 30 yards from the Haigler creek, East of the creek, which was running well and about 20 feet wide. 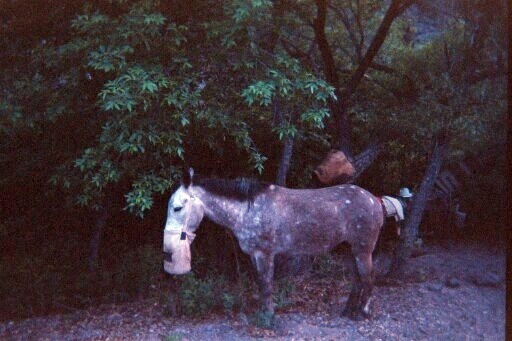 My new friends crossed the creek to the West & horses, mules and all... and camped there. 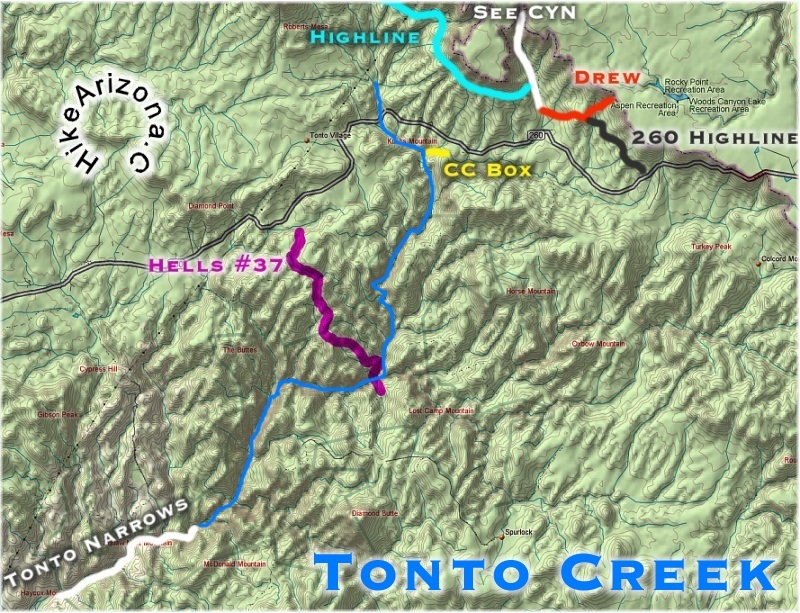 Basically, there were several camping areas down where the Haigler Creek feeds into the Tonto Creek, forming a perfect T. Tonto Creek is very wide, at least 100 feet where the two creeks meet. Plenty of water and, hopefully, some Trout for my new friends, who brought their fishing gear in search of fresh dinner. 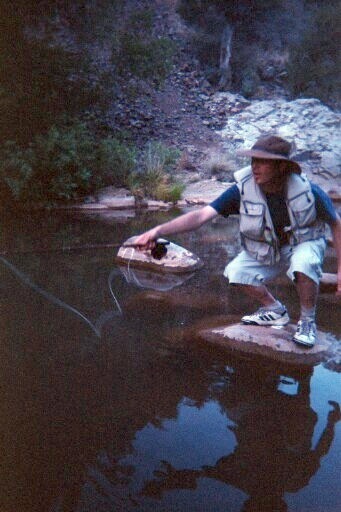 Paul had a regular fishing pole, while Joe and Dana were fly fishermen & especially Dana, who was clearly expert level. 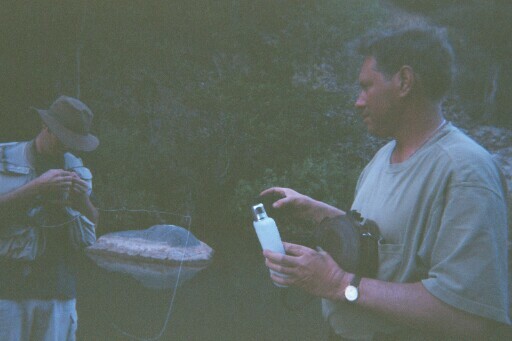 He was a wealth of information about native fish, and about many subtleties of fly fishing. Unfortunately, the bigger fish were not biting too well, but Dana caught several smaller ones. It didn't make for a feast, but I think the guys enjoyed their fresh fish nevertheless. I had MSR dried chili food for dinner, because it is hassle free, and my MSR pocket rocket can boil a cup of water in about two minutes. 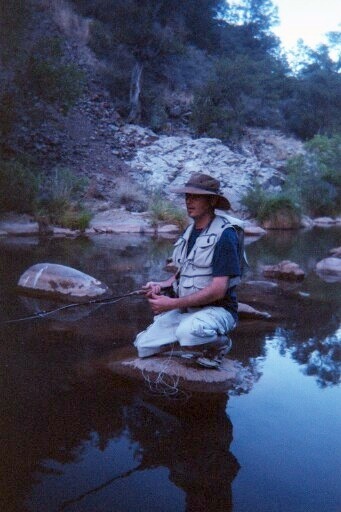 I didn't have the gear, nor the wherewithal, to wade around for hours trying to catch Trout. But fishermen love that, so let them fish. 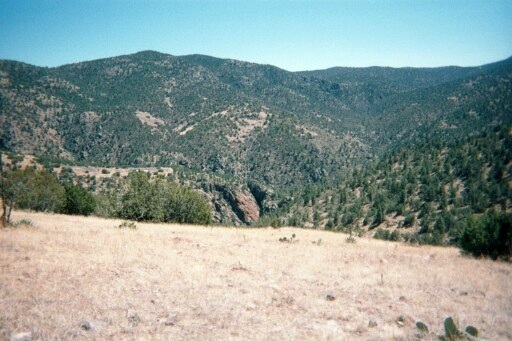 There are several side trips one could take while down in the canyon. I hiked up to the top of a cliff that overlooked Haigler Creek, about a 15 minute trek. While the hike wasn't technical by definition, it was difficult and very steep. From there, the views were very nice, as you can see from this picture. A point to remember about disposable cameras: the picture subjects always turn out much smaller and farther away than they appear in your viewfinder! I could see a small waterfall down below up Haigler Creek from my high perch, and figured one could do a nice canyoneering side trip in the summer when the water isn't so cold. At this time in May, the water was very cold, although not so cold that a real man (or woman) couldn't get in for a dip. 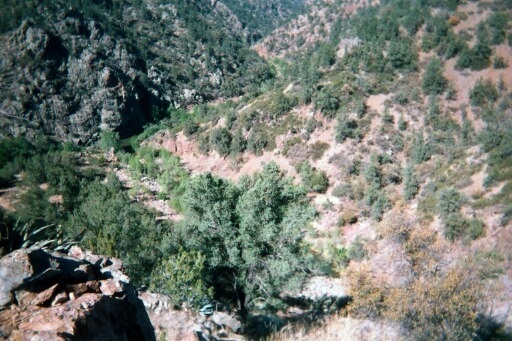 From above, I could also see that if one crosses Tonto Creek to the South, one could continue on the Hellsgate trail for a side trip. Up where I was, the view was majestic, with the evening sun making it all look surreal. Still on my first day, I descended down from my side trip and went over to visit my new friends. 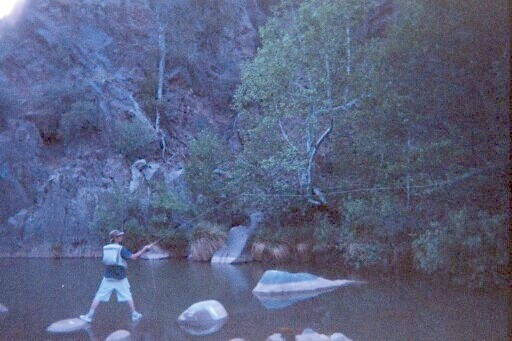 They were headed out for more fishing, so I tagged along heading West on the Tonto Creek, hopping rocks most of the way. That was fun, and there were plenty of large boulders to sit on or lie down and take in the sounds of water and wind, and the sights of the wilderness. 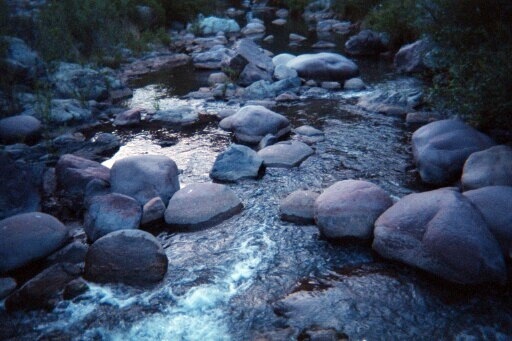 I laid down on one huge rock and enjoyed its warmth while the cold evening approached. While fishing, Joe was doling out his camping margaritas, a nice mix of Tequila and, I think, Crystal Light, or some such Kool-aid-type concoction. The margaritas were warm, didn't taste like anything you'd get at Z-Tejas, but they did the job for what and where they were. So after some partying, evening turned into night and I made my way back in the dark across the creek to my campsite. I wandered around for about 45 minutes but finally found my tent. There was a smell of skunk in the air, and all I could think of was getting sprayed while I wandered around in the thick brush in the dark. Joe told of a time when a dog he knew got sprayed, and I didn't want to suffer that fate. Fortunately, I didn't get sprayed and all was well. The good part was the shooting stars, three of which made themselves known to me while I lay in my mesh tent. The next morning I got up around 7 am and, after hot oatmeal and raisins, feeling like I could stay down there forever. I did a little more exploring and found another set of campsites above me a little. 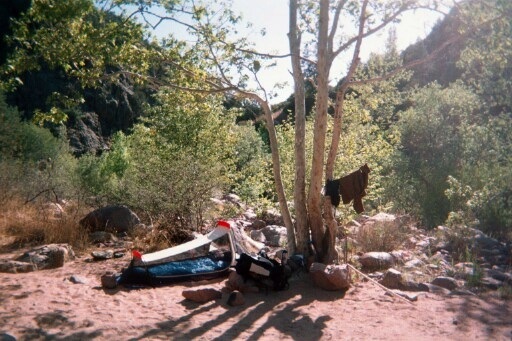 There was a tent rolled up under a tree with a note by it that read: "Please use this tent if you have need, but leave it behind for the next camper who needs shelter. Please don't take it home. Be as kind as the one who left it. Thanks." 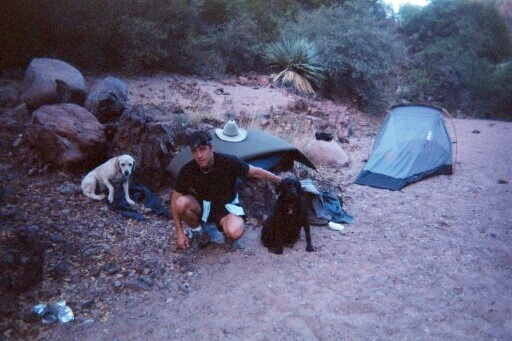 I packed up my gear and, before heading out around 10:00 am., traveled over to my horsemen friends' campsite. They graciously offered to carry out my pack on their mule and, although it was awfully tempting, I declined. For me at least, it is a requirement to pack in and pack out everything you need, by yourself. I probably should have waited until the afternoon to make my way out, because I forgot my sun block, and my hat! You don't want to do that, or your skin will peel for weeks after, as mine did. 7.1 miles is a long way to walk in the mountains with a pack and, in the hot sun with no protection, it is much worse. Fortunately it was May and not July. I made it out in about the same time I made it in, four hours. It seemed longer though, on the way back & probably because it was hotter and I had no protection from the sun. All in all, I would recommend this trip for anyone who likes to backpack and who wants a neat place to get away for a night or two. 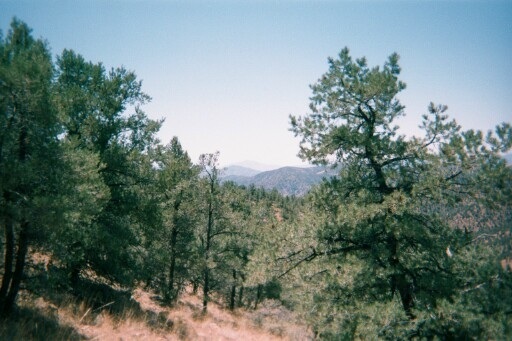 From Payson drive east on SR260 for about 11 miles to mile marker 263. Slow down as you pass Little Green Valley. The turn-off for FR405 is at the bottom of the down hill. Turn right into FR405, drive about 0.5 mile on a well graded dirt road. Recessed trail parking lot is off to the right. There is a sign next to a fence for the Hellsgate Wilderness.